Soccer has never been as popular in the US as it is around the world, but it seems to be gaining popularity as of late. I recently began to appreciate the sport with the men's World Cup last year. It was a lot of fun to see all the different countries competing against each other in the same game. The fact that it is teams from all over the world competing together makes it more interesting than just watching a competition between teams of the same country. Even though the US did not get too far in the tournament, it was still fun to watch. 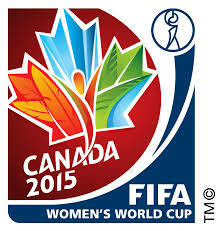 Which brings us to the 2015 Women's World Cup. Historically the women's US team has done well in this tournament and this year is no different as they have been doing great! I have been watching the games this year, not only the US games but other teams as well. I find the women's World Cup to be just as much fun to watch as the men's World Cup. The US team has a lot of great players and personalities which makes them easy to cheer for. The final game will take place this Sunday at 7pm eastern on Fox. I will be watching and I highly recommend everyone check it out as it should be a good game and the US team has the opportunity to win the World Cup! Update 7-5-15: Congratulations US Women's Team World Cup Champions! Update 3-16-16: The US Women's National team is now my favorite sports team and I continue to support them as they make their way to the 2016 Olympics in Rio!